The year is 1974. Mysterious figures step out of a makeshift spacecraft in Sun Ra’s film Space is the Place. It’s a pill-shaped structure with two spheres bulging out from either side, like eyes peering out into the galaxy. 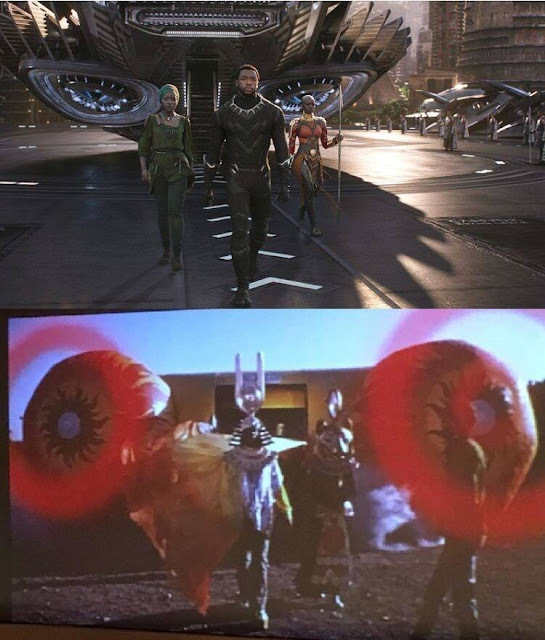 44 years later, in 2018, a strikingly similar image is shown in theaters worldwide; the Black Panther, king of Wakanda, stepping out of a vehicle quite like Sun Ra’s -- except Sun Ra’s balloon-like design is replaced with highly advanced technology that other nations can only dream of. Sun Ra, born in 1914, was a jazz musician whose music was heavily inspired by Ancient Egyptian mythology and futuristic elements of science fiction. His most famous record, titled Space is the Place (1973), became the face of an emerging creative movement and social phenomena that integrated science and technology into the black narrative. In his 1994 essay “Black to the Future”, author Mark Dery coined a catchy term to define this concept: afrofuturism. In 2018, a new hero became a household name and a proud representative of the afrofuturist genre: the Black Panther. The most recent installment in the Marvel cinematic universe takes place mostly in Wakanda, a fictional African nation that is run by incredibly efficient technology made by brilliant black minds. Black Panther reached audiences worldwide, during a time of socio-political turmoil in America and across the world. The movie smashed the box office, earning $218 million dollars during opening weekend alone. It became the highest grossing film in the Marvel Cinematic Universe in just one week. In April 2018, it passed Titanic, becoming the third highest-grossing film in the North American box office records. The movie’s popularity can not be solely explained by the fact that it belongs to the pop culture sensation that is the Marvel Cinematic Universe. The appeal of Black Panther extends to minority audiences, many of whom have never seen a black superhero before. The utopian world of Wakanda is powered by vibranium, a mysterious substance that absorbs kinetic energy, heals all wounds, and is weaved into the king’s suit. Vibranium has seemingly endless capabilities. This may be a metaphor for the power of melanin, the dark pigment that gives people of color their brown skin and dark hair. It’s possible that vibranium’s powers reflect the black community’s endurance, resilience, and magic. Wakanda is heaven for members of historically oppressed groups who once felt as if there was no place for them. The eerie similarity between the scenes from Space is the Place and Black Panther is far from coincidental. The Marvel film drew heavy inspiration from the legacy of Sun Ra. Both have become iconic images not only within circles of movie and music enthusiasts, but they have touched the lives of people all throughout the African diaspora. Afrofuturism is more than just another science fiction subgenre, it is an examination of concepts such as heroism, technology, and politics through the lens of black history and culture. It’s a vision of what the future could potentially look like. The longevity and success of afrofuturism is a nod to the fact that black don’t crack.